GEO has earned itself top billing in our report for the second day running, as the stock continued its rebound yesterday, reaching new highs, and pushing our options ideas deeper into the money. Despite multi-bag gains on Friday, we reasserted our interest in continuing to follow them, and it was definitely the right move. The GEO 09/16 $20 and 22.50 Calls were the targets we introduced on Friday morning, and our observed gains were extended by a healthy margin yesterday as GEO rose to a high of $25 even during the session. The $22.50 Calls traded up from 2.25 to 3.05 running 36% intraday, and representing an overall increase of 251% from Friday’s low of .87. As we stated yesterday, these ideas should remain good for as long as GEO sustains this strong rebound pattern. BBY is flying high in the premarket this morning in the wake of its earnings release which contained a major increase in same-store sales for the quarter. With the type of activity we’re witnessing early on this morning, we’re going to want to signal a range of options calls to observe here as well. Our specific contracts of interest are going to be the BBY Weekly 36.50-39 Calls, which will hold our interest provided that BBY maintains support in the low $36-range on any pullbacks. We’re going to take this opportunity to declare a bottom-watch for FAC, which is currently feeling out its lowest prices in a month after peeling back off of a massive run in late July. 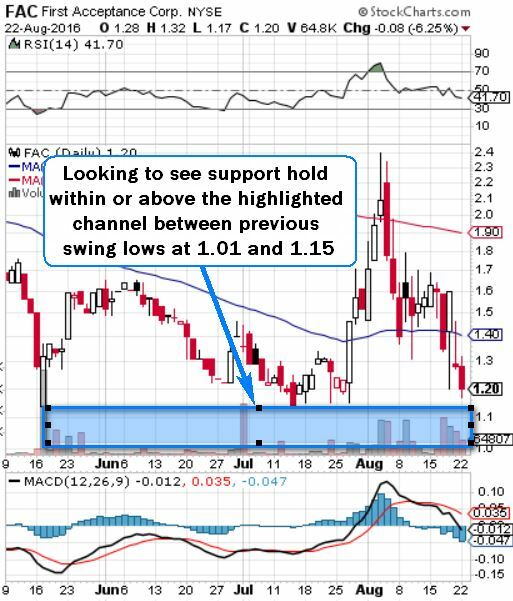 On the chart below, we’ve highlighted the channel between recent swing lows at 1.01 and 1.15 as the area where we’d like to see a bottom-bounce occur, and we’ll have FAC on our radars in the days ahead for the possibility of that occurring.